Over 20 great designs, suitable for all Masonic Orders. Two options, Personalised and Non-Personalised. Printed onto 300gsm gloss white card, A4 folded to A5. PRICES INCLUDE ENVELOPES, VAT and DELIVERY TO A UK MAINLAND ADDRESS. Fully Personalised Christmas Cards give you the choice of various greetings, typestyles and colours, together with your personalisation details. 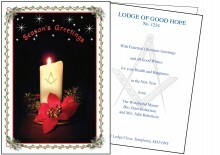 Non-Personalised Christmas Cards are supplied with a standard greeting, printed in black text.